New Delhi, 11 July 2017: In the august presence of Shri Bandaru Dattatreya, the Minister of State (Independent Charge) for Labour & Employment, A Memorandum of Understanding (MoU) between ESIC and Directorate General Factory Advice Service & Labour Institutes (DGFASLI) for collaboration in the field of occupational health and prevention of occupational injuries and diseases signed in New Delhi today. Speaking on this occasion, Shri Dattatreya said that Ministry is committed to providing social security for the workers across the country. The MoU will help in spreading awareness for healthy working conditions, reduce the danger of diseases or injuries and provide good quality life for workers. a. Assessment of OSH challenges in all the spheres of economic activity. b. Special activities for prevention and control of Asbestosis, Silicosis and other occupational diseases. c. Development of training modules for different target groups. This Memorandum comes into force from today and will remain in force for a time period of three (03) years. 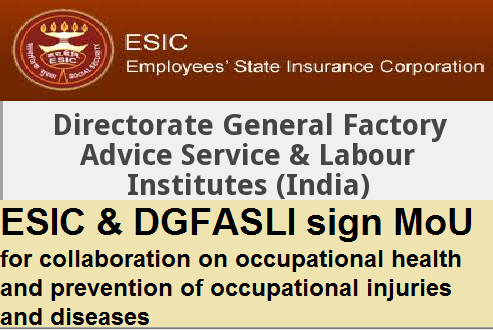 ESIC & DGFASLI sign MoU for collaboration on occupational health and prevention of occupational injuries and diseases, The collaboration aims at improving the quality of life through joint scientific research following other activities:- a. Assessment of OSH challenges in all the spheres of economic activity. b. Special activities for prevention and control of Asbestosis, Silicosis and other occupational diseases. c. Development of training modules for different target groups.